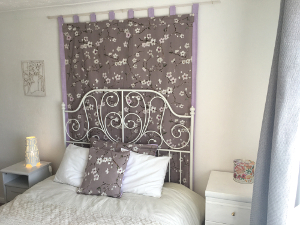 Give your bedroom a fabulous focal point with an easy to make hanging fabric panel that hangs neatly behind your bedstead. This beautiful design will work for any size of bed and is a suitable option for both adults and older children. The first step is to measure the width of your bed as this will be the width of your wall hanging. 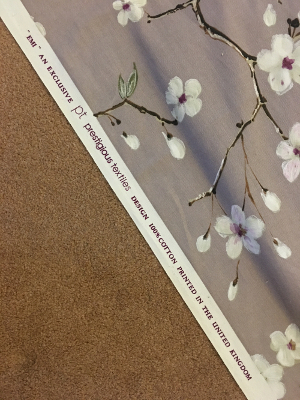 Secondly choose your fabric: if the fabric decoration is for adults choose a large pattern in complimentary colours to enhance your existing room decoration scheme. A thick cotton or upholstery weight fabric is best to keep it looking luxurious. It is a good idea to use washable fabrics and you could upcycle a pair of curtains or an heirloom bedspread as part of your project. Re-use a piece of fabric if you want to keep the costs down and also be extra environmentally friendly. A good time to your favourite or a great vintage fabric design. We have selected an end of roll off cut by Prestigious Textiles called Emi. 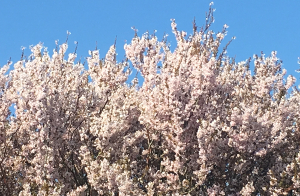 Emi has a simple and elegant Spring flower and pretty buds and looks really fresh as well as blending visually with the other interior elements in the bedroom perfectly. You can also choose to 'back' a thinner fabric with an extra cotton lining fabric layer. This backing gives it extra weight and makes sure the finished piece has a substantial appearance. If the fabric is for children or teenagers you can go bolder with colour and introduce a striking pattern too. Step three is to decide where you want the horizontal line to be that will have the wooden pole from which you will hang your panel. It may help to make a small pencil mark on the wall here. Then measure down to a point 150mm from the floor. This will be the bottom of the wall hanging and it will fall behind your bed and below your mattress but above the skirting board. The forth step is to purchase a 30mm in diameter wooden pole from a large home decorating retailer. Cut the pole to the width of your bedhead plus 50mm. so it just pops out each side using a small saw. Step five is to paint the cut wood pole to size to match the existing background wall colour behind the bed and leave to dry. Wash your plain and patterned fabrics according to the manufacturers instructions so they will not shrink again when you launder the finished wall hanging. The sixth step is to lay your plain fabric out on a flat surface or a clean floor and measure out a rectangle the same size as your final wall hanging size (from pole height to above the floor height) and the same width as your bedhead. Step seven means adding 50mm all the way round to allow for hemming. Use a large right angled edge (or large sheet of paper) to keep the corners square. Cut this bed sized rectangle out with large sewing scissors. Fold and hem all around the rectangle to give a neat edge. If you are using a narrower roll of fabric than the bedhead width you may need to join two lengths together at the sides to form one large rectangle. The eigth step is to cut out eight 300 x 100 strips of fabric to make tab tops and hem neatly around the edges with the sewing machine. Step nine involves machine stitching the tab tops to the plain rectangle ensuring the ends go to the back of the panel along with the hemmed edge so the neat side is facing out. 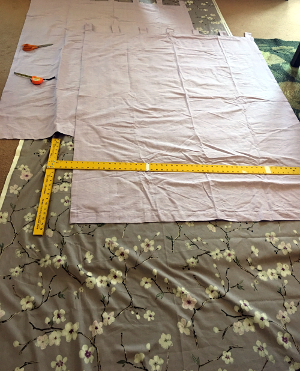 To complete step ten lay your patterned fabric out on a flat surface as before and measure out another large rectangle. You can use your plain hemmed fabric panel as a template here. As before stitch two widths together if your fabric roll is not as wide as your bed. Be careful here to pattern match correctly so make sure you allow enough fabric for your pattern repeat if necessary. Hem your patterned piece 50mm narrower than your plain panel using the sewing machine of possible, so you will have a pretty plain line showing around the edges like a slim 'frame'. Make sure the patterned panel is facing print side up and any turned edges are facing towards the back and lay the patterned piece on top of the slightly larger plain panel. Step eleven is to machine or hand stitch the fabric layers together. Ensure the design is the right way up and the tabs are on the top edge. The twelth step is to press your new panel as hot as is recommended for your chosen fabrics. In step thirteen purchase three gold or silver cup hooks large enough to comfortably hold your painted pole. If your bed is bigger than a standard double or your fabric is very heavy you may need a few more hooks to carry the weight securely. Measure and mark with a pencil three or more points where the pole will be held horizontally at the chosen point at the top of your wall and use a spirit level to check they are lined up correctly. Use a drill to make small pilot holes in your walls and add wall plugs if you need to. Screw the cup hooks straight into the wall. Alternatively you could use large 3M plastic hooks designed to hold 2.5 kg if you are renting and not allowed to make holes in the walls as these say they will remove cleanly if you want to take tham off after a while. We recommend stickng to the 3M brand and avoiding cheaper imitation products. Step fourteen is to thread your tab tops onto the pole and carefully place your new hanging symmetrically above your bed tucking in the length of the panel behind your bedhead. Then stand back and enjoy your new boutique hotel style bedroom wall feature. 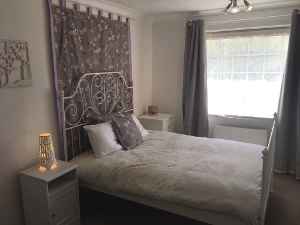 We love the way it makes these simple scroll beds from Ikea 'pop' when set against a plain white wall. It may suit you to make two fabric panels to change from summer to winter or even four or more to reflect the changing seasons of the year. Once you have the hooks in place in the wall it is easy to string up another panel like changing up your flags to suit the occasion. One idea could be to make two and alternate them if one is removed for washing and pressing. 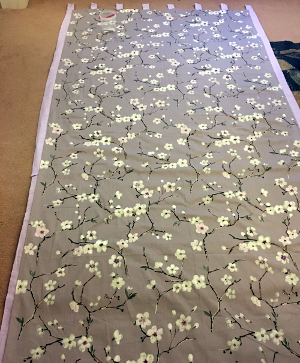 To get the look quickly without the detailed sewing time or if you don't have a sewing machine you could also use a duvet the right size for your bed. Pair with a coordinating sheet in a thick quality cotton and press carefully and hand sew them together around the edges as above. Hand finish with thick gross grain ribbon and hand stitched tab tops if you want a smart finish. Enjoy your own original design that brightens up your boudoir most so it is charmingly ready for royalty. You may be too busy running your palace and attending to your duties. So contact us at Create Display about assisting you to make a personally designed panel to suit your most regal rooms requirements.